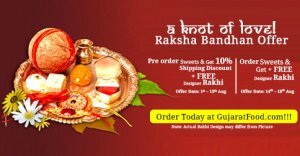 Celebrate the bond of love with GujaratFood.com special Raksha Bandhan offer. Pre-order your favorite sweets before 13th of August and get flat 10% shipping discount along with a beautiful designer Rakhi Free. Not only this, if you order sweets from 14th to 18th August, you can still get a designer Rakhi free. Hurry up, offer available for limited period only.